Underneath each picture I have a list of the pieces used to make the outfits. 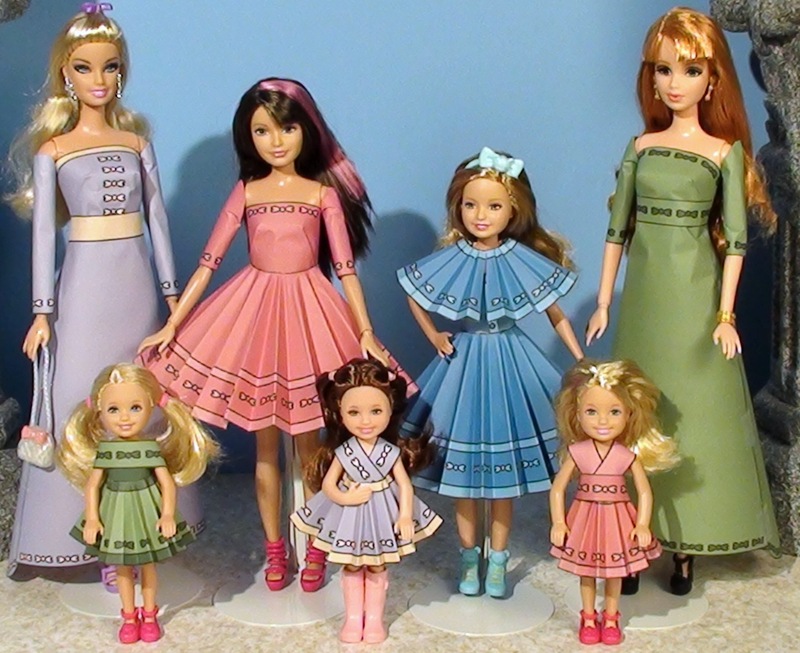 From left to right on the tall dolls, I’ll give details on the little dolls dress under the picture below. Purple dress is made from a top, flared skirt, belt, and straight sleeves. Pink dress is top, circle skirt, and elbow length straight sleeves. Blue dress is top, circle skirt, and cape. Green dress is made from a top, empire waisted flared skirt, belt, and elbow length straight sleeves. The pink dress has straps and a small circle skirt with a belt wrapped around both. The purple dress has the small circle skirt wrapped around the straps. On this dress I taped the straps in place directly to the doll. The green dress has a belt, a small circle skirt and a wrap around collar. 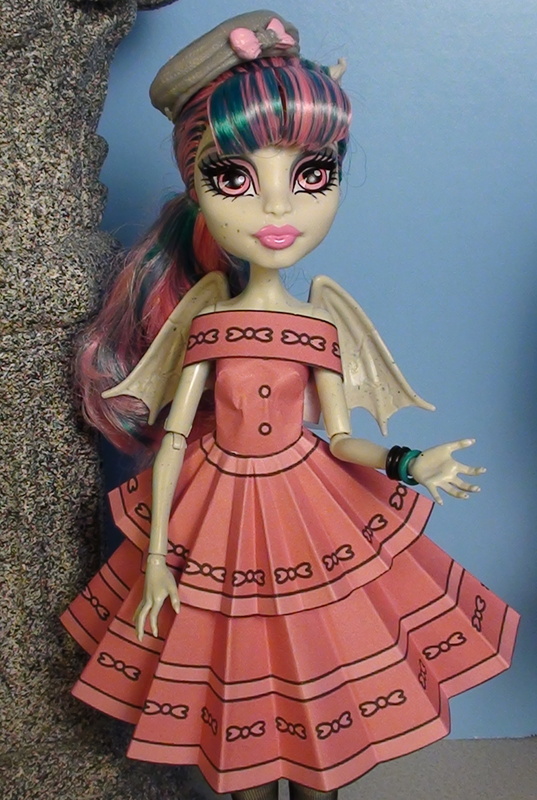 Rochelle Goyle has a top, circle skirt, small circle over skirt, and wrap around collar. Stardoll Barbie is wearing a top, circle skirt, and straight sleeves with puff sleeves over them. Bratz Kool Catz is wearing a top, circle skirt, and middle puff sleeves. Midge is wearing a top, flared skirt with belt, and elbow length straight sleeves. Winx Club Musa is wearing a top, circle skirt, and wrap around collar. Disney Store Sleeping Beauty is wearing a top, circle skirt, small circle over skirt, and wrap around collar. Elissabat is wearing a top, circle skirt, straight skirt over skirt, and wrap around collar. Pinkie Cooper is wearing a top, circle skirt, small circle over skirt, and shoulder straps. Moxie Girlz Lexa is wearing a top, circle skirt, and wrap around collar. Stacie is wearing a top, circle skirt, and cape. Kira is wearing criss crossed shoulder straps and a small circle skirt. Skipper is wearing a top, circle skirt, and straight sleeves.